Offering rapid-fire accuracy at a reasonable price. With its new ergonomic design and its award-winning PinSeeker with JOLT Technology, the Tour V3 Jolt Slope sets the standard for being the complete laser rangefinder package – design, performance and feel. JOLT Technology eliminates all doubt by delivering short vibrating bursts to reinforce the laser has locked onto the flag. Use what the Pros use, feel the exact distance. .. feel the JOLT. Features Bushnell’s patented Slope Technology that provides the golfer with compensated swing yardage depending on the degree of incline or decline. With its new ergonomic design and its award-winning PinSeeker with JOLT Technology, the Tour V3 JOLT sets the standard for being the complete laser rangefinder package – design, performance and feel. The Bushnell Tour v3 JOLT builds upon the prior generation Bushnell Tour V2, with the same magnification (5x), range performance (5-1000 yards), and accuracy (to within 1 yard). The Tour v3 introduces Bushnell’s JOLT technology, which provides short bursts of vibration to indicate that its PinSeeker technology has locked onto a target. The Bushnell Laser Rangefinder JOLT technology may not be for everyone, but if you don’t like it, you can turn it off – we found ourselves appreciating it more over time. We do note that the Tour v3 does not always indicate that it has locked onto the target (via icon of a circle surrounding the flagstick in the display) even when it is returning the correct distances, and if the device hasn’t determined that it is locked on, there will be no accompanying vibration. As a result, it became clear that we didn’t absolutely have to have indication that the laser was locked onto a target – if the distance appears accurate, it probably is. A little bit of a delay when displaying the JOLT distance after the vibration at times from long range. 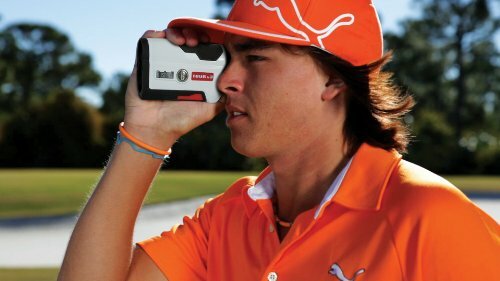 Bushnell Tour v3 Laser Rangefinder The Bushnell Tour v3 Laser Rangefinder features award-winning PinSeeker with JOLT technology that provides the golfer short vibrating bursts to confirm PinSeeker is activated and the laser is locked onto the flag.